Imagine if you could send funny, embarrassing, even dirty pictures to friends without them being saved or used as blackmail later in life. Well, there’s an app for that. Snapchat is an app that allows users to send pictures and videos that are automatically deleted after they are opened. Senders can choose an amount of time anywhere from one to 10 seconds. Originally thought of by a fraternity member to solve the problem of regretting embarrassing texts or sexts, Snapchat is now used by 18.6 percent of iphone users in the U.S. according to Onavo’s App rank, an online ranking website. Snapchat was created by 23 year old Evan Spiegel for a product design class. After presenting the idea to his class and seeing their reactions, he released the app to the public a few months after in September 2011. The app is available for iphone, and android users. While students all over the country have embraced and have come to use Snapchat as part of their daily lives, many are worried about where those snapchats really go once they leave your phone. Jaclyn Bitto, a senior from Chicago has her concerns about the app. “Even though they say it gets deleted, I worry they might use it somehow,” Bitto said. Students using Snapchat should know that unopened Snapchats are stored into the company’s Google cloud and remain there until they are opened and deleted. If the files are not opened, they remain on the company’s server for 30 days before being deleted. 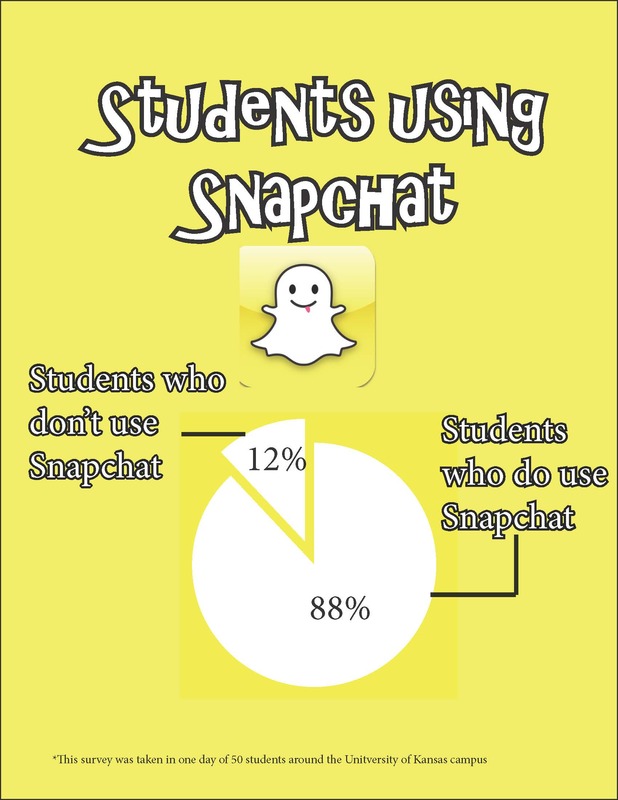 Some students don’t use Snapchat because they haven’t heard a lot about it. Rebeka Luttinger is one of the students asked of the few who don’t have Snapchat. “I don’t even know how it works,” Luttinger said. Snapchat is different from other social media in that it is private. Snapchat does not store any history or information about its users like other apps like Facebook and Twitter. The company knows nothing about its users. Alex Prather, a senior from Derby, Kan., uses Snapchat about once a day. She chooses to use Snapchat instead of other social media platforms to connect with new friends. “Snapchat seems more personal than adding someone on Facebook or Twitter because you choose to send them pictures.” Prather said. She likes that she doesn’t have to flood peoples’ Facebook news feed when she wants to share pictures with her friends. The fact that you can personalize your pictures makes it more fun. While Snapchat can be fun and innocent between friends, many raise concerns about sexting, especially because a lot of Snapchat users are under the age of 18. Just recently, 10 boys were arrested in Canada for distributing explicit photos of teenage girls through the app. Snapchat is not just another iphone app fad. Spiegel recently turned down two billion dollar offers in hopes that he can continue to grow and expand Snapchat into his own empire. There is no better feeling than being five years old again waking up early on Christmas morning to rush down the stairs and see a pile of presents under the tree from Santa. Christmas is a holiday celebrated all over the world, and while the main concept is the same, each country has their own way of celebrating. The French start the celebration of Christmas on December 6th with the feast day of St. Nicholas. St. Nicholas was a man who sold what he had to give to the poor. One story is told about a man with three daughters who could not afford their dowries. On three separate occasions a bag of gold was found in their stockings hanging by the fireplace. Children began hanging stockings and putting shoes out in hopes that St. Nick would stop by their house and leave a little gift. Christmas in France is called Noël. Noël comes from the phrase “Les bonnes nouvelles,” which means literally, “the good news” and relates to the good news of Jesus’ birth in the Bible. Clarisse Barbier, a French teaching assistant at the University of Kansas, is from Besancon, France. When asked what her family does different from the U.S. for Christmas, she mentioned one of the most popular Christmas traditions in France. “To be honest, the only thing different is the Marché de Noël,” Barbier said. The Marché de Noël is a Christmas market. Most cities in France will have Christmas markets starting late November up until Christmas. These markets sell everything from food to Christmas crafts and usually surround a large decorated Christmas tree in the town square. Families will attend Christmas Eve services, and then go back home and eat a Christmas dinner followed by the Bûche de Noël. Christmas meals differ in each region in France. In the West, the French eat fish or roast goose for their Christmas Eve dinner. In northern regions, crêpes are a popular dish. Down South, 13 desserts are served to represent Jesus and his 12 disciples. After dinner, children open presents from parents and are sent to bed. Unlike the U.S., where Santa is the one who brings the presents, children in France are told that either “Père Noël” or Baby Jesus bring the gifts Christmas morning. The next day, the children jump out of bed and race downstairs to see what new gifts this year will bring. One step inside the red rustic barn and a warm glow hits your face. Strings of lights wrap around a white cloth canopy covering the ceiling creating a soft romantic atmosphere for guests strolling into the reception. Wooden tables are surrounded by twelve wooden chairs and are marked by numbers carved into a coaster-size cut wooden log laid out on the table. Blush pink flowers are placed in each corner of the room complimenting the soft lavender colors of the bridesmaid dresses as the bridal party walks across the barn taking their seats to eagerly await the newlyweds. Valerie Whited, a recently engaged student at the University of Arkansas, started using Pinterest about two years ago. Like many girls, before her engagement, Whited had a dream wedding board where she pinned ideas for her future. Now, it has become a practical part in the planning stage of her wedding. According to the Pinterest website, Pinterest was created in 2010 as a tool for collecting and organizing the things that inspire you. It is an online pin-board where users share ideas by “pinning” photos of anything from fashion and crafts to teaching methods and resume tips. Only a year and a half after launching Pinterest, it became one of the top ten social network services with eleven million weekly visits. Despite the quick rise in popularity, Whited had her doubts about the website before she joined. She first heard about Pinterest from friends talking about it on other social media outlets. At first she disliked it because she thought it was materialistic and was just a way for girls to fantasize over things they want, but realistically will probably never have. After giving it a try, she thinks it is a great way to express yourself as an adult. “It’s all about finding your personal style,” Whited said. Pinterest is not only for personal use, but businesses can also benefit from creating a company account. Companies can upload pictures of products using different SEO words and hashtags to market and promote their merchandise or services. Businesses are able to view their web analytics and see how much traffic each pin gets. According to Bizrate Insights, a company that conducts customer surveys, 70 percent of online consumers use Pinterest to get inspiration on what to buy. In addition, 39 percent use Pinterest for special offers and coupons from retailers and brands they have pinned. While Businesses and individuals can benefit from everything Pinterest has to offer, teachers are also benefitting from this social media god-send. Ariel Puccetti, a recent University of Kansas graduate and current elementary teacher, has been using Pinterest for a little over two years. As a teacher, she uses Pinterest to find supplemental materials for centers, extra practice or creative projects. Teachers are able to share ideas on different teaching methods and classroom decorations through Pinterest. “It is a great place to go to gather information and ideas from other teachers and from a variety of sites to incorporate creative and engaging activities in a classroom,” Puccetti said. Though Pinterest offers many diverse pins relating to women and men, only 30 percent of Pinterest users are male. In 2012 alone, 1,255,225,000 minutes were spent on the Pinterest website from a computer, 720,973,000 on the Pinterest App and 120,486,000 on mobile web. “It’s no wonder I’m always thinking, I know I pinned that somewhere,” Puccetti said. For many American students, going to school and working here in the United States is a part of our everyday lives. However, for many French citizens coming to America is a dream. The number of French students studying in the United States has increased 17 percent over the past seven years according to the International Business Times. 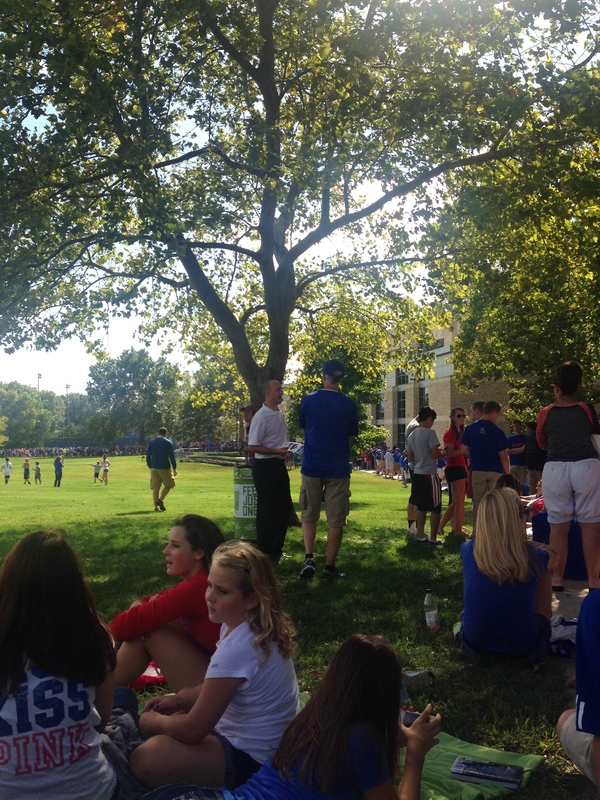 Despite this increase, I had a tough time trying to find French students taking classes at the University of Kansas. After emailing multiple University departments and contacts trying to find a French student taking classes at the University, I was told that many French students opted out of being contacted for University projects. Shortly after, I received an email from Clarisse Barbier, a University General Teacher’s Assistant (GTA) from France, who was more than willing to sit down and answer my questions. Barbier left her home in Besancon, France to become a GTA for the University French department. She arrived in the U.S. for the first time this August and is currently teaching French for Beginners. Barbier came to the United States to move on and start a new life. In Besancon she received her Masters degree in English, but had not been able to use it. She took this opportunity to use what she learned while starting a new chapter in her life. Even though she has graduated with her Masters, as a GTA at the University she is still required to take classes. Many French students choose to come to the U.S. to study because the U.S. school system is more efficient and has more money than in France, said Barbier. Unlike the U.S., public universities in France are free. Because school is more expensive in the U.S., students are more studious and the curriculums are more intense. “It’s much more demanding than in France,” said Barbier. Barbier only takes two classes at the University, but said she works harder for these two classes than she ever did for her Masters degree. Like Barbier, Amadine Thevenet-Brown also has an English degree from France. Thevenet-Brown is a kindergarten teacher at Academie Lafayette, a K-8 French Language Immersion Public Charter School in Kansas City, Mo. Thevenet-Brown, originally from Nevers, France, came to the United States for the first time in 2009. She had just completed her Bachelor’s Degree in Anglo-Saxons studies and English language and planned on teaching English in her home country. But before she started, she wanted to spend a year abroad in an English speaking country. It was her dream, like many other French students to come to the United States. “After arriving in the U.S., I was even much happier than what I had expected,” Thevenet-Brown said. French citizens have been influenced by American culture since they were very young. They watch American movies, listen to American music and even take required English classes at school. Many fantasize about coming to the U.S. imagining it like the setting of their favorite television show. For many it may be a fantasy, but for some their dream becomes a reality. Francois Asal, a 21-year-old French student, spent seven months working as an intern at Walt Disney World in Orlando, Fla. He said he has always been attracted to the U.S. Asal describes it as the land of the self-made man, big cars and skyscrapers. While the United States is one of the larger English-speaking countries, two other popular places to go for French citizens looking to use their English include the United Kingdom or Australia. Many French students travel to the UK and Australia, however most choose the U.S. because of affordable living and distance. “England is really close and we can go there whenever we want to. It’s different with the U.S.,” Asal said.